You are here: Home / News / Conservatism Is? (ThyBlackMan.com) Many or us, like me, refer to ourselves as conservatives. And that means something – something different to almost everyone. Ask a dozen people what a conservative is, and you’ll get a dozen varied answers. This is why it’s really not proper to just call oneself a conservative. 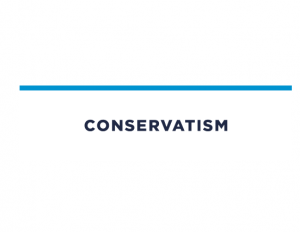 Because everything these days seems to boil down to politics, the term conservative invariably evokes an emotional response, much like the term liberal, or progressive. But if we strip away the politics, a conservative is just one who wishes to conserve, or preserve. Conservative is broadly defined as one who is disposed to preserve existing conditions, institutions, etc., or to restore traditional ones, or to limit change. So we see that the term conservative is much too broad. By using this broad-brush definition, one could say that many of today’s radical left-wing groups are conservative, as they wish to restore the radical traditions of the 1960s, or even Soviet-style communism. We could accurately claim this of any person or group that desires a return to long-lost traditions – good or bad. For it to be properly or more precisely defined as we “conservatives” wish, the word must therefore be bound or affixed to another – a prefix, suffix, or adjective, such as constitutional, originalist, fiscal, or social. So which one is most appropriate? I suppose it depends on who you ask and how they wish to define themselves. We’ve all heard people describe themselves as fiscally conservative and socially liberal. For the average Joe or Jolene, this may be adequate, but it doesn’t work within the political spectrum. It simply can’t. A politician can’t separate social policy from fiscal policy, as they are intertwined. Setting fiscal policy will always have some sort of social component. Take, for example, the great debate over whether to stop government funding of Planned Parenthood. That’s a social policy measure that also has a fiscal component, or vice versa, depending on one’s motivation. For this reason, many conservatives, myself included, think these descriptors are just a dodge or cop-out by slick politicians. For many of us, the default descriptor is “constitutional conservative.” Yet there is a problem with even this seemingly proper adjective. It doesn’t tell the story adequately, as the Constitution is merely a framework of governance. Therefore, the term “originalist” is a better descriptor than “constitutionalist” for some conservatives. It is understood, at least to those with knowledge of America’s founding, to describe not just that which pertains to the governance of our nation, but also the intent of the founders – their societal, moral and religious code, their vision for our nation – not just a framework of governance. This simple code, which is laid out in the Ten Commandments, transcends any era and the Constitution. And apart from the first four, even a good-hearted yet avowed atheist would agree that these Commandments should be the pillars of a properly ordered life and properly ordered society. Add to this, two other simply principles. The Golden Rule, to treat others as you would like to be treated, and Jefferson’s rule: “But it does me no injury for my neighbor to say there are 20 gods, or no God. If it neither picks my pocket nor breaks my leg, what difference is it to me?” Who couldn’t or wouldn’t agree that this is a foundation of a pretty good ordering of one’s life and society? This is what it means to be an originalist conservative. Originalist conservatism is not merely a political ideology, but an ideology of self. This of course doesn’t mean, and our founders certainly didn’t mean, that everyone had to convert to Christianity to be welcomed in America. They were actually quite accepting of other faiths. After all – they knew a bit about being persecuted. The bottom line is: If we throw out all the labels and identifiers like conservative, liberal, progressive, Republican, Democrat, etc., and just started living our lives and asking our government to abide by these eight simply principles, we’d all be a lot better off. At the end of the day, I think that’s a bit more important than how we label ourselves.